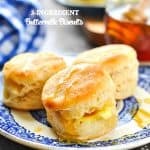 Aunt Bee’s easy 3-Ingredient Buttermilk Biscuits are flaky, buttery and ready for the oven in 10 minutes! 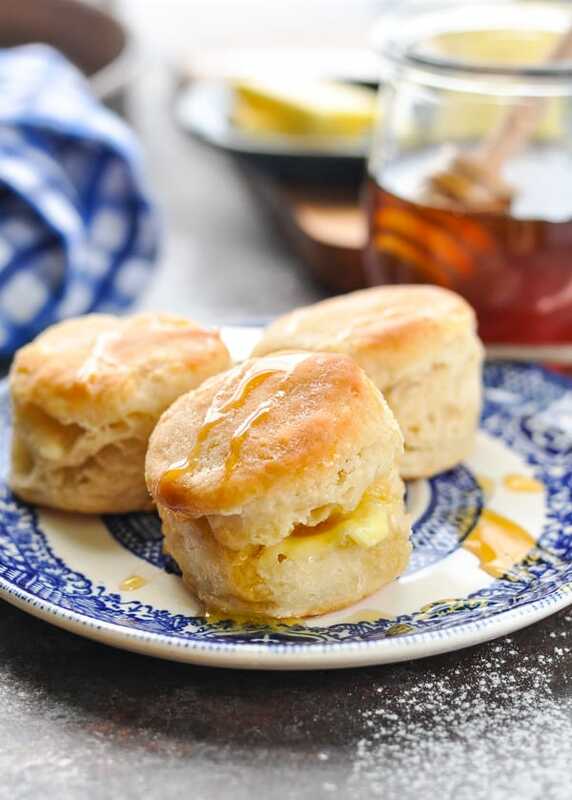 You won’t believe how flaky, buttery, and easy Aunt Bee’s 3-Ingredient Buttermilk Biscuits are! The freezer-friendly treats come together in about 10 minutes, and offer a perfect solution for your next weekend brunch, or for a side with that warm bowl of soup or tender roasted chicken. This versatile recipe is one that you’ll turn to time and time again! 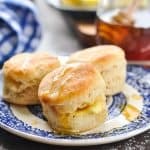 My great Aunt Bee never steers me wrong — especially in the kitchen — and these classic Buttermilk Biscuits are no exception! I’m no snob, and I certainly believe that there’s a time and a place for those tubes of refrigerated biscuit dough (I use them regularly in a pinch! 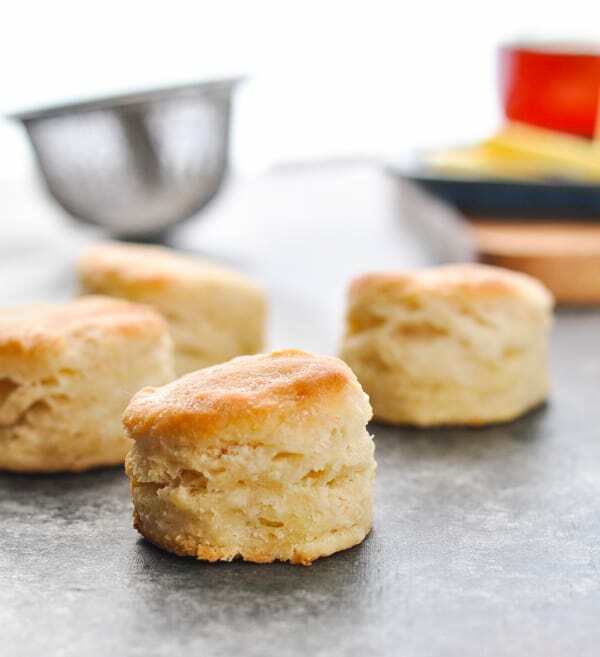 ), but when I want a beautiful, thick, fluffy, and easy biscuit ready to serve in less than 30 minutes, this is the recipe that I turn to. Aunt Bee’s recipe calls for self-rising flour, buttermilk, and butter. So simple! But, if you don’t have self-rising flour on hand, or if you don’t have buttermilk on hand, don’t worry — you can still make these biscuits. I’ll share some simple substitutes below, so don’t miss those tips! 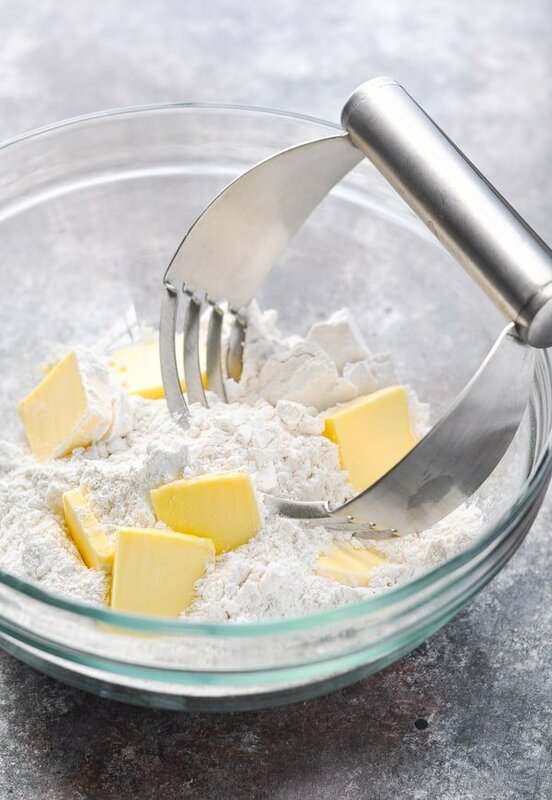 First, cut the very cold butter into the flour using a pastry cutter or forks. You want the little pieces of butter to look like large peas — that’s when you know it’s ready. Then stir in your buttermilk, adding small amounts at a time, until a soft dough forms. Pat the biscuit dough onto a floured surface and shape into a rectangle or circle that’s about 3/4-inch thick. No rolling pin necessary! 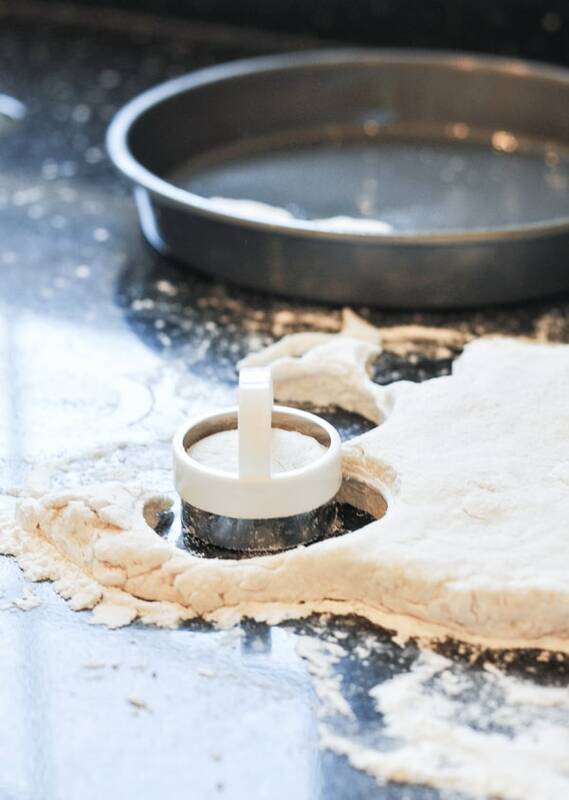 I use a 1-1/2-inch round biscuit cutter to yield small biscuits; however, you can use a 2-inch (or similar) cutter for larger biscuits. Whatever you prefer! 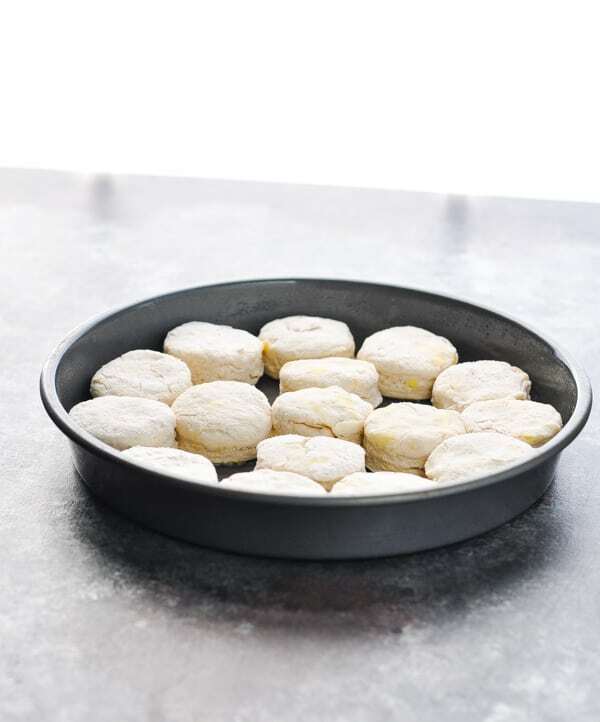 Place the biscuits in a round baking pan that has been lightly sprayed with cooking spray. Make sure that the biscuits are touching in the pan (this helps them rise nice and tall, with soft sides and crispy tops)! 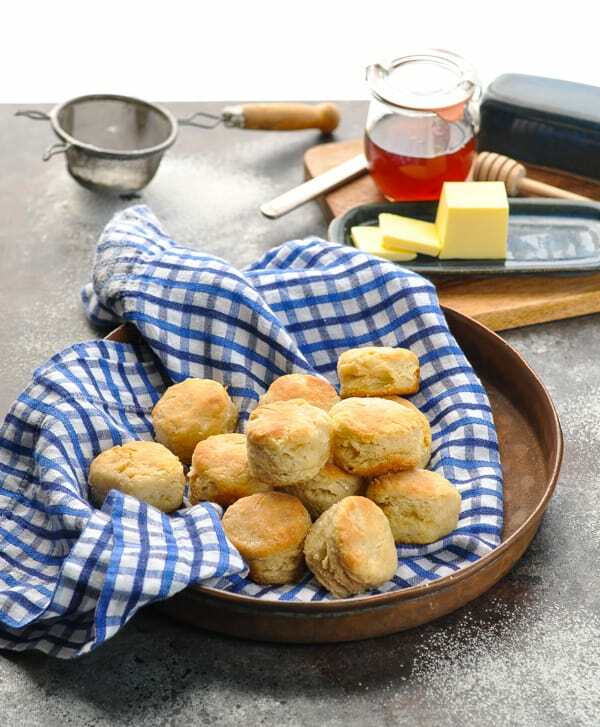 After about 14 minutes in the oven, you’ll be greeted by a beautiful, golden tray of warm buttermilk biscuits. Tip! I like to brush the tops of my biscuits with melted butter during the final 2-3 minutes of baking time, just to help them turn a crispier, more golden brown color. It’s totally optional, though! HOW DO YOU MAKE HOMEMADE BUTTERMILK? 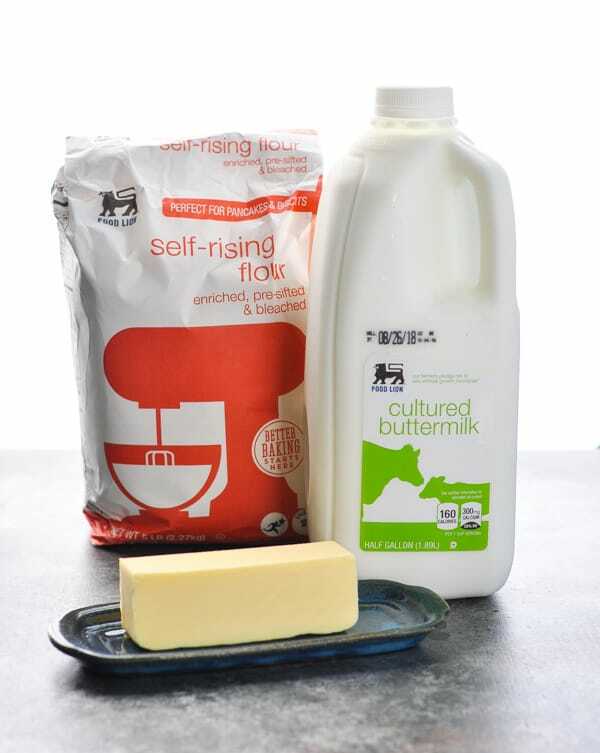 You can make 1 cup of homemade buttermilk by using regular milk + either lemon or white vinegar. To do so, pour your milk into a small bowl. Add either 1 tablespoon of freshly squeezed lemon juice or 1 tablespoon of white vinegar. Give it a stir, let it sit for about 5 minutes, and then use it in the recipe as directed! And if you don’t have lemon or vinegar? Just use regular milk in this biscuit recipe! They will not have the “tang” of buttermilk, but they will still taste good! HOW DO YOU MAKE SELF-RISING FLOUR? If you don’t have a bag of self-rising flour in your pantry, that’s no problem. 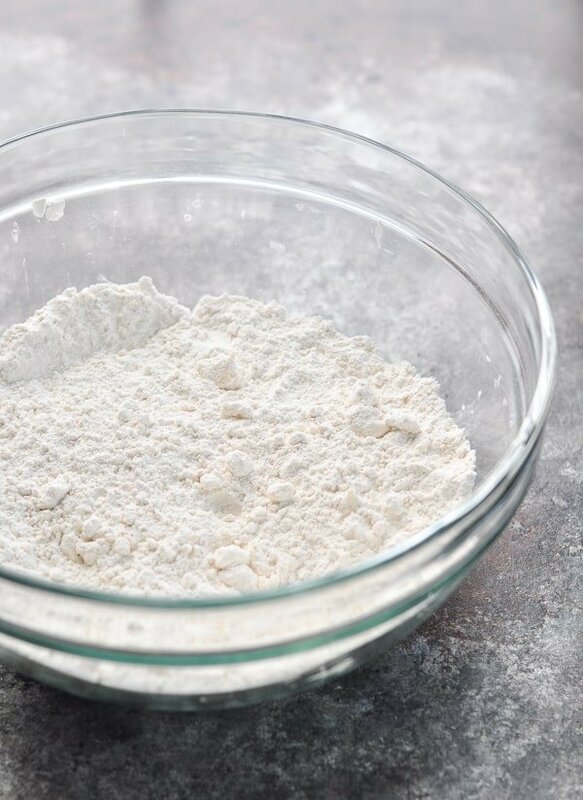 You can make 1 cup of self-rising flour by placing 1 cup of all-purpose flour in a bowl. Whisk in 1 teaspoon of baking powder and 1/4 teaspoon of salt. This recipe calls for 2 cups of self-rising flour, so you would need to combine 2 cups of all-purpose flour with 2 teaspoons of baking powder and 1/2 teaspoon of salt. See what I mean? 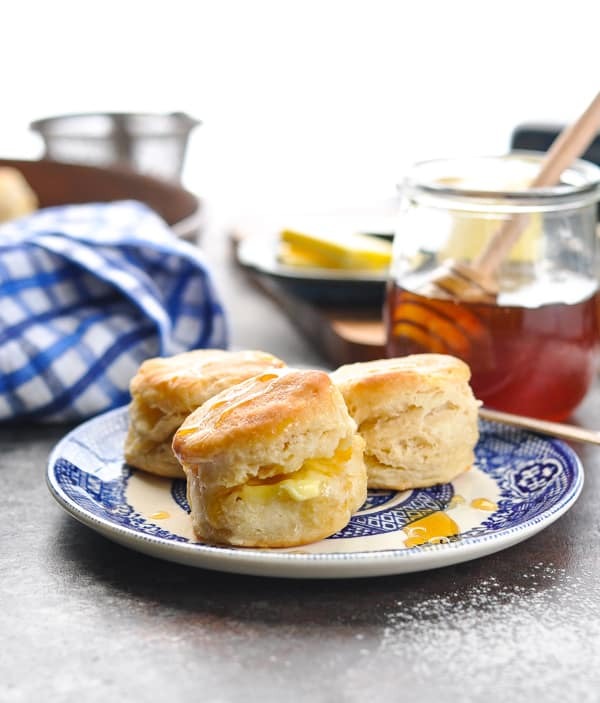 You can have homemade buttermilk biscuits any night of the week! Preheat the oven to 425°. Spray an 8-inch or 9-inch round pan with a light coat of cooking spray and set aside. Place flour in a large bowl. Use a pastry cutter or forks to work the butter into the flour until the lumps are about the size of large peas. 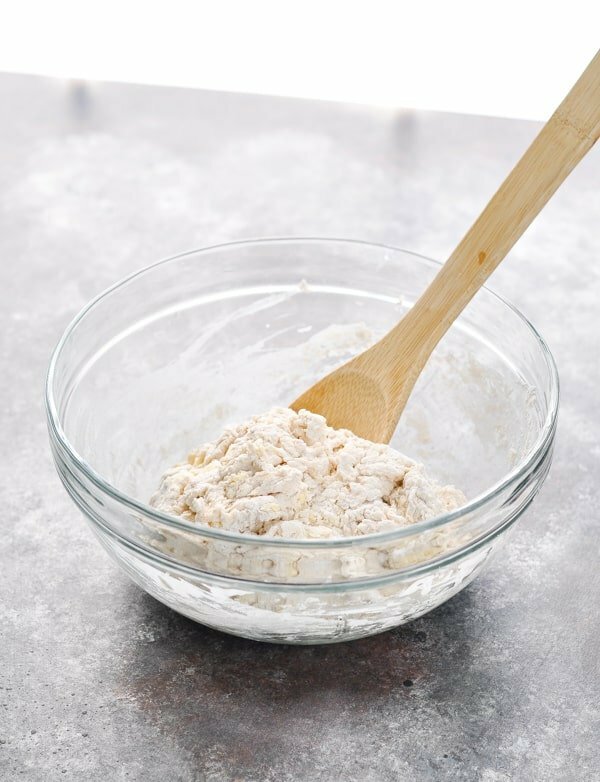 Add 2/3 cup of buttermilk, and use a wooden spoon or spatula to stir until a soft dough forms. Add small amounts of buttermilk slowly, as needed, until the dough reaches this consistency. Flour a work surface. Place dough onto floured surface and knead it once or twice. If the dough is sticky, feel free to sprinkle it with more flour, as needed. Pat the dough out until it’s about 3/4" thick. Use a biscuit cutter to cut out the individual biscuits. I used a 1 ½ -inch cutter, which yielded 16 small biscuits. You can also use a 2-inch cutter to yield about 12 biscuits. Place the biscuits in the prepared pan so that their sides are touching. Bake for 12 -15 minutes, or until they're a light golden brown. 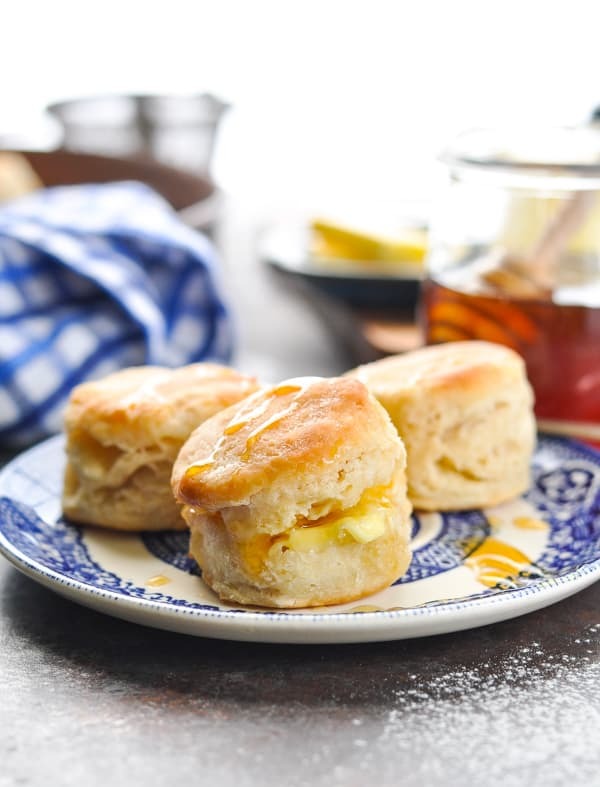 Brush the tops of the biscuits with melted butter during the final few minutes of baking for an even more golden top. Have leftovers or want to make these biscuits in advance? Allow the biscuits to cool completely; wrap tightly, and store at room temperature for a couple of days or freeze for up to 3 months. 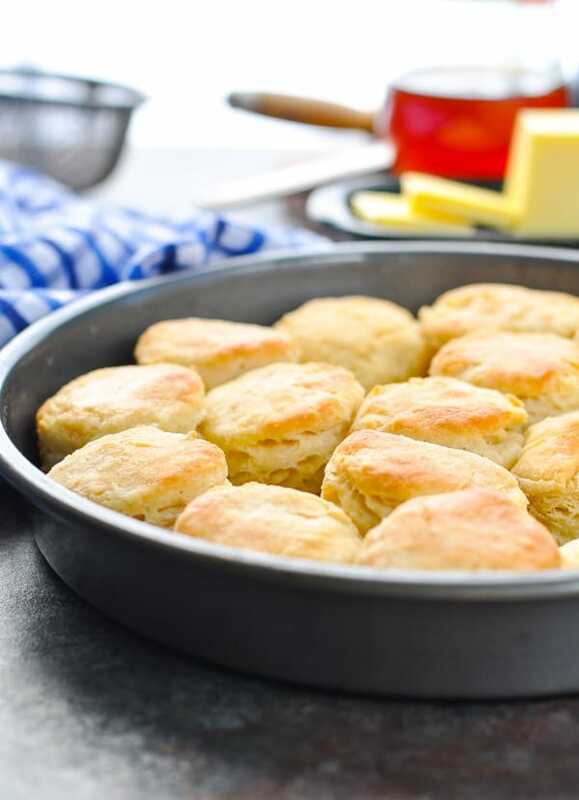 To reheat room-temperature biscuits, place on a baking sheet, tent lightly with foil, and bake in a 350°F oven for 10 to 13 minutes, until heated through. Gorgeous biscuits, Blair! We love buttermilk biscuits, and yes, a store-bought kind doesn’t come close (I actually have an old post about buttermilk biscuits on my blog). Great tip to brush the tops with butter while they are baking, I’ll try that. I always keep buttermilk in the fridge, it lasts forever. If not used to bake biscuits or pancakes, it is a great marinade for chicken breast. I am so going to try this. 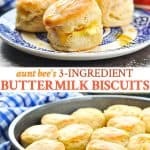 Unfortunately we do not get buttermilk in stores here so will make my own using your tip in the blog post. Pinned this right away and definitely trying this over weekend! Thanks for sharing such an amazing recipe. It’s funny, I remember my mom melting the Crisco in a saucepan, adding the milk, then the flour and pinching dough, rolling it into a ball and flattening them on the baking sheet. They were delicious and we kept a plate of them on the stove and just grabbed one whenever we wanted! Mmmmmmmmmmmmm.